I've had so many thoughts I've wanted to share regarding our decision to move. I've had a few people ask me if it's been worth it and how we've felt about it, so I'll share what we've seen and felt throughout this adventure since it is drawing to a close. I have no doubt that the Lord has complete and utter understanding of every single one of our needs. It has been amazing to me to watch the blessings that have come from this and the unforeseen problems that weren't as awful as they could have been because we were guided in this direction. It's been so humbling and has helped me learn to trust Heavenly Father more and His plan for each one of us. It's incredible how everything came together and I've felt how much Heavenly Father loves me and my family. First, I know our renters were an answer to our prayers. We weren't sure what to do when we had such bad luck finding people in the beginning and then suddenly they appeared and we just knew they were the right choice. 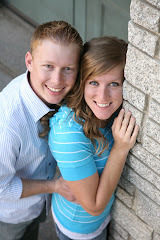 We hardly know them but they just radiate goodness and our ward is crazy about them. I've felt complete confidence leaving things in their hands and it really helped me feel calm about the whole situation. They have been a huge blessing. Second, I can't even come up with the right words to express how grateful I am for my mom and the help she's been. Not only did my parents open their home to us and allow us to completely take over their TV, but she really helped me through the pregnancy and my mess of a self as I've tried to adapt to two kids. Physically she has helped with Kennedy when I've been too sore or exhausted to care anymore. I hate to think where Kennedy would be right now without the extra attention and love she's received because I just haven't been the best mom lately. We couldn't have predicted how difficult this whole pregnancy was going to be and if we were on our own I would probably have been committed. She's also helped me mentally when I've been bored to tears (literally) and she has come home and offered me some company and adult conversation and stepped right in and has helped with the kids. I've felt like a shut in and she's brought some sanity to this crazy part of life. And a lot of the time She feeds me, too. How great is that? I'm really going to miss her. This has been 100% worth it on the financial spectrum and we made some serious progress. I feel like I've shared too much of our personal finances in the past and it's really no one's business, but I didn't want people thinking we don't live within our means. But, regardless of my honest description of how things are in our family people have formed their own opinions and conclusions anyway. So I'll let people think what they want since they will anyway and just say it's been successful, which was the reason for this whole thing in the first place. Things are not settled at the mine and it's still a roller coaster ride (and will be for a while) but we are more prepared for whatever lies ahead and have learned valuable lessons about what's important, how to sacrifice, and trusting Heavenly Father. We've learned that life is unpredictable and it's important to be prepared and it's important to follow the promptings of the spirit to guide us on the best road. We've had unforeseen things happen that could have been disastrous if we hadn't have made this choice. They were still setbacks, but they were minor compared to how they could have been. I've been grateful for this decision and opportunity every single day. We don't know what life has in store for our long term future. As Kennecott continues to struggle to recover from the landslide, anything is possible. We could be just fine or Cory could be laid off, or anything in between. I feel like this experience has helped us learn to roll with the punches and prepare for the worst case scenario but have faith for the best. We love our home, but we know it's just a thing and it's not what makes us happy or good people. We've grown closer as a couple and a family. And for the record, living with my parents really wasn't bad. In fact, I'm going to miss them. I know Kennedy sure is going to, too. I'm grateful for the Lord's plan for us and His guidance in the lives of my family. I'm thankful He knows best and takes care of us and that His love is always there, whether we deserve it or not. Although it's been crazy the last year, I'm grateful for Cory's job and that for the time being he still has that job. I will be eternally grateful for his willingness to work so hard to provide for us. He truly is an amazing and good man, through and through. I don't deserve him some days. We're excited to be back home and have been blessed to have this time in our lives. I feel like we're moving home closer, wiser, and obviously with one more family member. So to answer the question, yes, it's been worth every moment.